Whey is a big buzzword in the active world. Not just for bodybuilders, whey protein is a key ingredient of many muscle recovery drinks catering towards all kinds of athletes. But have you ever really wondered – what exactly is whey and why is it so common in these products? What about its relatively unknown counterpart, casein? Is that good too? This article should help answer these questions and others that you may be curious about. Let’s revisit Little Miss Muffet, who sat on her tuffet, eating her curds & whey. Remember her? Well, the curds she was eating were cheese curds, probably similar to cottage cheese, which is primarily casein protein. The liquid surrounding those curds contains whey in its raw form. In the process of making cheese, curds and whey are separated and then can be processed differently. If you want to stop reading now, here is the short version of this story: whey and casein proteins both come from mammalian milk. Casein makes up about 80% of the milk protein while whey makes up the remaining 20%. Casein is slow to digest, making it a nice protein for a before bedtime snack or to keep cravings from occurring during the day. Whey is fast to digest, making it ideal for use in a recovery drink post workout. Let’s dig in the chemistry, shall we? 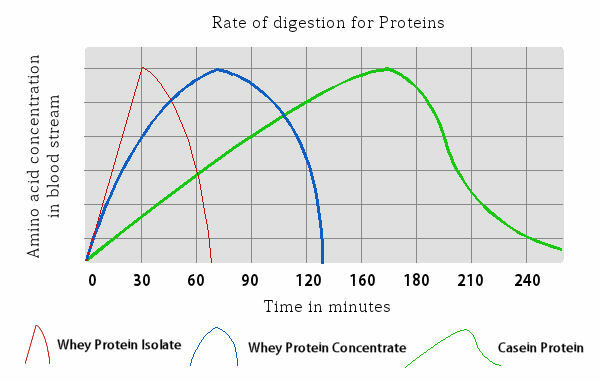 The difference in the molecular structures of whey and casein proteins accounts for the differences of their respective digestion curves. 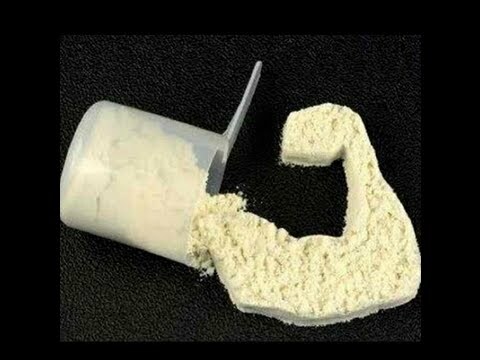 Whey protein is simple, consisting of only amino acids in a globular structure, and is relatively soluble. Casein, in contrast, lacks what’s called a “true tertiary structure”, taking a form resembling a denatured globular protein. This results in the hydrophobic portions of the amino acid building blocks to be exposed, making the overall protein insoluble in water. Because of this, casein molecules aggregate into colloids when in solution. Because both whey and casein are derived from the same source, their amino acid profiles are similar. Whey does contain greater amounts of glutamine and leucine, however both proteins have the amino acid content necessary to meet normal dietary needs. Whey is a fast acting protein with amino acid levels in the blood peaking 20-30 minutes post consumption, and fully metabolized within the hour. Casein is absorbed at a much slower rate, peaking in the blood 3-4 hours after it is consumed, with peak levels much lower than those experienced with whey. Casein takes much longer to absorb than whey because it coagulates when coming into contact with certain stomach enzymes, in a process very similar to the curdling of milk. This coagulation slows the digestion of all other contents in the stomach. This creates the feeling of satiety, or “fullness”, for the individual. Both proteins are complete, meaning, they contain all the amino acids. However, because casein is slow to digest, we say that it has an “anti-catabolic”, or anti-muscle-breakdown. This is because the slow digestion process helps provide a trickle of amino acids into circulation over a longer period of time, helping to prevent the breakdown of muscle tissue. In contrast, whey protein provides a faster influx of amino acids into the blood stream, providing muscle tissues with materials necessary to stimulate muscle synthesis and growth after trauma, exhaustive exercise, etc. For this reason, we call whey an anabolic, or muscle-building, agent. Both are positive, but just slightly different ways that dietitians like to categorize them. For athletes, as long as no allergy or intolerance is present, both proteins are an excellent source of amino acids. Whey is a great choice to deliver a quick and abundant supply of amino acids to exhausted muscles, especially post exercise when a faster influx helps to start the recovery process. Avoid casein post workout, as its coagulating effect will slow the absorption of other nutrients consumed, delaying the delivery of protein and other nutrients needed for proper muscle recovery. For those who are looking for a protein supplement during times of inactivity, such as between workouts or before sleep, casein would be the better choice in order to put the kibosh on the breakdown of muscle and to give the athlete a good feeling of satiety (so as not to binge on other junk food!). Goeff HD & Hill AR. 1993. Chemistry and physics. In Y.H. Hui (ed. ), Dairy Science and Technology Handbook Vol. 1: Principles and Properties, 1-82. VCH Publishers, New York. Mahe S, Roos N, Benamouzig R, Davin L, Luengo C, Gagnon L, Gausserges N, Rautureau J & Tome D. 1996. Gastrojejunal kinetics and the digestion of [15N]beta-lactoglobulin and casein in humans: the influence of the nature ad quantity of the protein. American Journal of Clinical Nutrition, 63: 546-552. Walstra P & Jenness R. 1984. Dairy Chemistry and Physics. John Wiley and Sons, New York. Wong NP, Jenness R, Keeney M & Marth EH (eds.). 1988. Fundamentals of Dairy Chemistry, 3rd edit. Von Nostrand Reinhold, Yew York.